Zorro is a beautifully put together small stallion. Zorro is a beautifully put together small stallion bred by Rory Sweet in the UK. His dam, Forrest,was sourced in New Zealand by Jim Gilmore and played for the Ellerston high goal team until Kerry Packer retired from playing. She was then bought by Rory Sweet and played in the Vampire Bats polo team by Rory and Andrea Vianini. Zorro’s full sister, Sativa, is an outstanding mare played by Sapo Caset in the 2010 Gold Cup winning team and won best playing pony in the 2011 USPA 26 Goal Piaget Gold Cup. Zorro’s sire, Chess, is a proven polo pony sire with progeny playing in the High Goal. Top Secret, his grandsire, is very prominent in the Argentine Open bloodlines. 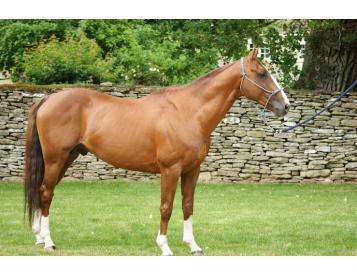 Zorro is owned by Mark Tomlinson and has numerous progeny on the ground.